Real Time and Archived Satellite Imagery Click the rectangles on the map to see images of ocean temperature. Click here for tips on interpreting these images (clouds & navigation). The images in this database are from the Advanced Very High Resolution Radiometer(AVHRR). We record approximately 9 of these passes per day with our L-Band satellite dish. These images are just a small sample of the area over which we can collect data. The satellite dish on our roof allows us to see as far south as Puerto Rico, as far west as Nevada, and up to 65 degrees N latitude and 40 degrees W longitude. The images on the following pages have been calibrated to show sea surface temperatures. Land temperatures, though slightly inaccurate, show the heat emitted from major cities (such as Philadelphia and NYC). Currently we track the NOAA-15, 17, and 18 satellites. The raw satellite data is processed to sea surface temperature using the Multi-channel Sea Surface Temperature (MCSST) algorithm using SeaSpace Terascan software. For detailed information on this algorithm check out the primer (pdf file) written by our colleague Dr. Frank Monaldo at Johns Hopkins University. Our data is stored in an HDF file format and is plotted using Matlab. The AVHRR sensor has a spectral resolution of 5 channels in the visible and infrared spectrum. The spatial resolution of the data is 1km. The US coastline (drawn in black) is taken from the NOAA Coastline Extractor database (World Vector Shoreline 1:250,000). Bathymetry (also drawn in black) is obtained from the Smith and Sandwell Bathymetric dataset and units are in feet. 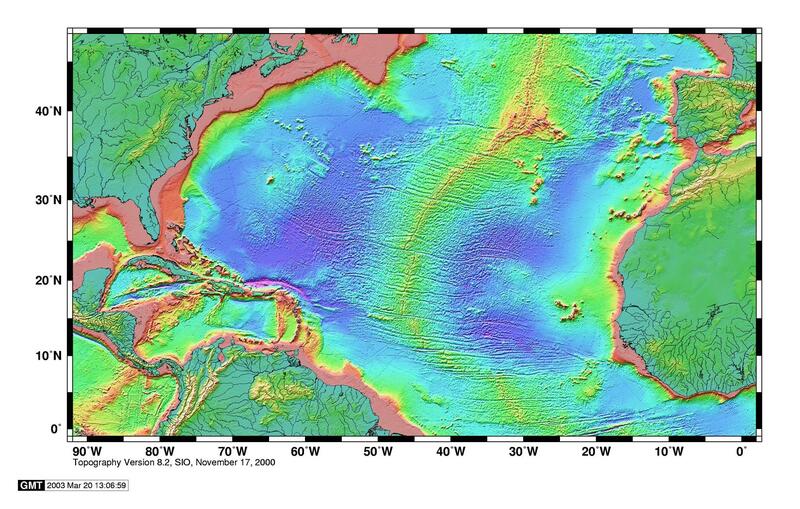 Most images have the edge of the continental shelf (600 feet or 100 fathoms or ~200 meters) drawn. Smaller regions have more shallow bathymetric contours. All time stamps are in Greenwich Mean Time (GMT) which is 4 hours ahead of Eastern Standard Time from March to November and 5 hours ahead the rest of the year (daylight savings time is not observed in England). In many of the images you will notice large light violet areas. These are either cloudy areas that were not cold enough to be eliminated by the computer, or areas that are outside of the temperature scale. As you see more and more images, you will learn the difference. Finally, these images were auto-navigated using the predicted satellite position, which may be slighty in error, resulting in a shift of the coastline. Errors in the auto-navigation typically occur when the majority of the pass is cloudy or the area is at the edge of the pass swath. In the former situation pixels appear distorted due to the extreme angle of which our satellite dish receives the pass. Exact navigation requires human intervention.